After stopping off at Starbase Yorktown, a remote outpost on the fringes of Federation space, the USS Enterprise, halfway into their five-year mission, is destroyed by a powerful, unstoppable wave of unknown aliens. With the crew stranded on an unknown planet and with no apparent means of rescue, they find themselves against a ruthless enemy with a well-earned hatred of the Federation and what it stands for. Only a rebellious alien warrior can help them reunite and leave the planet to stop this deadly menace from a possible galactic war. Although I’ve seen a considerable number of episodes of the television serie Star Trek at a young age, I’ve never felt like a real Trekkie. It fascinated me, but not to such an extent that I’d greet everyone in my daily life using a Vulcan salute. When the next generation Star Trek episodes started (with the charismatic Captain Picard), I was even less interested and existence of this serie faded for me completely. Three years ago I saw “Star Trek Into Darkness“. And to my surprise this was already the 12th motion picture with the Enterprise still boldly going where no man has gone before. It really didn’t blow me away. It wasn’t so adventurous as in the television version where they repeatedly discovered new civilizations. Probably it has something to do with nostalgia. 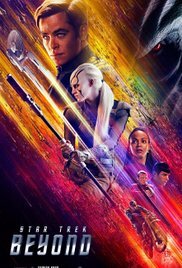 But to be honest, “Star Trek Beyond” made a huge impression on me with its breathtaking images and great action scenes. I was even a little bit moved by the scene with the Flagship Enterprise gradually being reduced to a pile of scrap metal. Seeing this legendary spacecraft lying completely destroyed on the planet Altamid, really hurts. But it’s common for every Star Trek episode that they find a solution to resolve the impossible situation. The same applies to this film. Although there were a few moments when it felt a bit exaggerated. But I have to say that the images from the Space Station Yorktown, the attack by Krahl’s swarm and the crash of the Enterprise were stunning and impressive. Yorktown is a spherical space station (with the look of a snowball according to Bones) with an ingenious gravity system. A futuristic-looking artificial planet which resembled what we saw in “Elysium” and “Interstellar“. And it’s populated by all sorts of races and creatures. And I must admit, the fantasy of the creators is still alive and kicking when it comes to creating alien species. Relocating the field of action to the surface of the planet Altamid was a smart move. The breakup of the crew in different groups and their attempts to regroup was a refreshing idea and contributed to the build up of tension. The warlike Krall (Idris Elba) has only one goal. And that’s destroying the United Federation of Planets by using the Abronath biological weapon. A weapon designed by his ancestors who lost control over this destructive weapon. Despite the immense layers of makeup, Idris Elba managed nevertheless to show an appearance full of expressions. Krall looked as threatening as ominous. The most exciting and fascinating character was that of Sofia Boutella as the alien Jaylah who can stand her ground in confrontations and also has some technical skills. What stood out were the various humorous situations and dialogues. Simon Pegg’s contribution I suppose. What bothers me the most about a movie like “Star Trek beyond“, is the casualness when solving certain issues. The technical (unintelligible) lingo is being used again at that moment. So, warpspeed isn’t functioning anymore? No problem. They’ll momentarily redirect some energy from the warp core to the impulse engines. Want to bring the compressors from a wreck back to life? One well-aimed shot with your laser gun will take care of that. And during a chase at the speed of light, a problem occurs that needs a quick solution. Again no problem. A blueprint is projected (and I guess they know its content by heart) and before you know it a ready-made solution is being offered . But isn’t this part of the charm of a legendary phenomenon like Star Trek? Otherwise they never could have gone boldly where no one ever set foot before!